Here we have a quick giveaway for some protein bars, three boxes worth. Open to US residents only, you have through 9/1 to enter. Good luck. 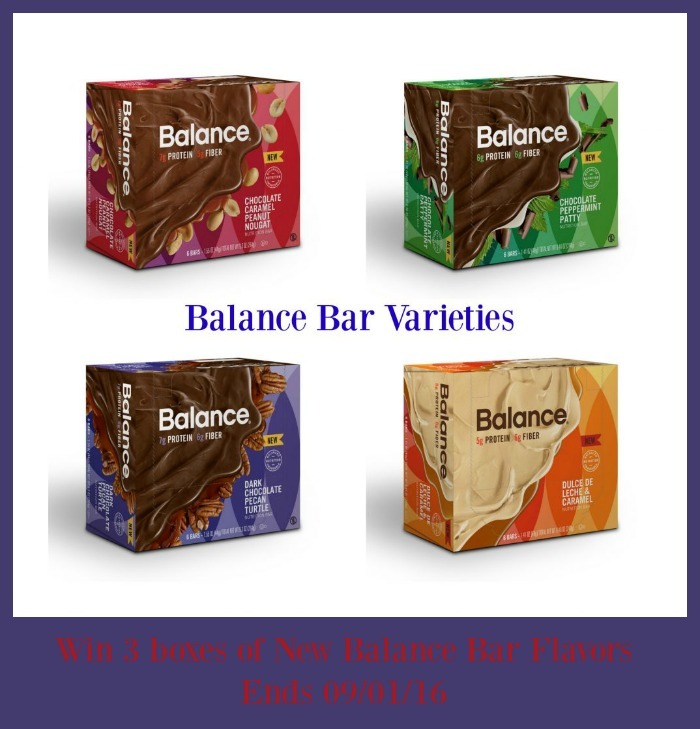 One lucky reader will receive 3 delicious boxes of Balance Protein Bars! Giveaway ends 09/01/16 at 11:59 pm ET! Open to US residents 18+ and older. The Dulce de Leche & Caramel are soooo good! I like chocolate and mint, so the Chocolate Mint Cookie Crunch flavor sounds good to me. I really want to try the Dulce de Leche and the Chocolate Peppermint! I am most looking forward to the Chocolate Mint Cookie Crunch bar. I would love to try the peanut butter balance bar. I definately want to try the Chocolate Mint Cookie. Yum! The Chocolate mint is always the best! I want to try the Caramel Nut Blast! Awesome giveaway, definitely curious about the Chocolate Mint Cookie Crunch Balance Bar! I want to try that Dark Chocolate Pecan Turtle. I would love the chocolate mint. I want to try the Chocolate Mint Cookie Crunch the most! I want to try the chocolate caramel peanut nougat! I would most like to try the Caramel Nut Blast Balance Bar. Any of the chocolate flavors look good to me!! But especially would like to try the dark chocolate pecan turtle. yum. I want to try the chocolate caramel peanut nugget one. Dark Chocolate Coconut sounds really good. I'd like to try the chocolate peanut butter bars. Thanks for the chance. I'd like to try the Chocolate Mint Cookie Crunch Balance Bars. i want to try the chocolate mint cookie crunch. i am a huge fan of balance bars. I want to try the Chocolate Mint Cookie Crunch flavor. I want to try the chocolate mint cookie. I would like to try the mint chocolate. I also would most like to try the S’mores Balance Bar the most! Thanks so much for the opportunity! Oh, the chocolate mint cookie crunch sounds really good! We would like to try the Chocolate Mint Cookie Crunch.